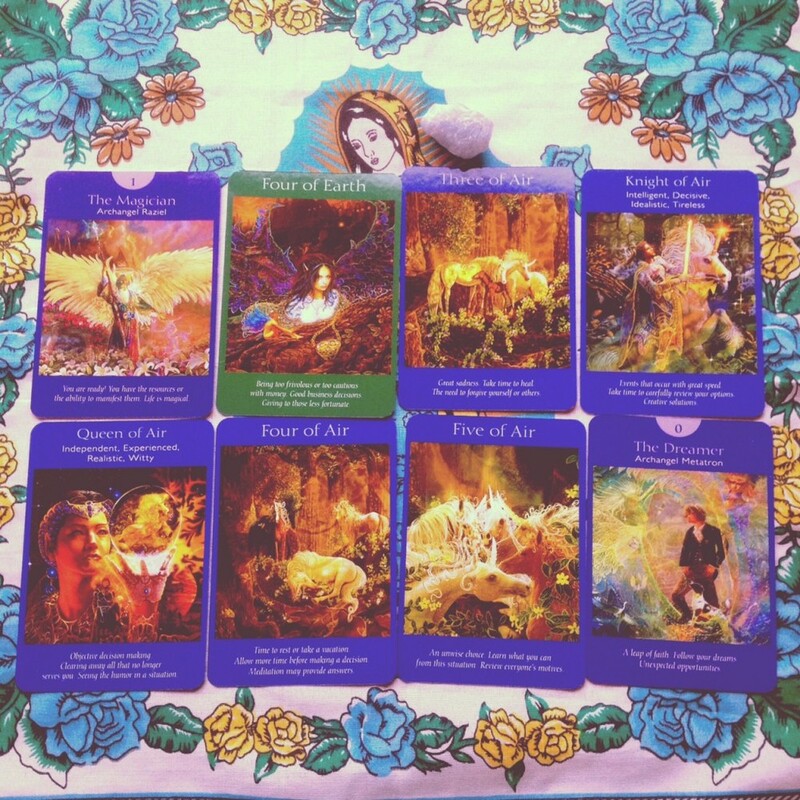 This week our reading comes via the Angel Tarotby Doreen Virtue and Radleigh Valentine. There's a lot of debate going on about Tarot versus Angel Tarot or Angel Cards and I'm going to put it out there right now - I don't think there is any difference. Of course there are differences - e.g. Angel cards are 'softer', the art work is different, etc., but I really think the energy and messages all come from the same place. A lot of people have this idea that Angels are some fluffy bunny Christmas decoration type beings, that people who like Angels are 'airy fairy' or too sensitive or whatever. But did you guys know that actually Angels aren't even Angels? OK, that sounds random. What I mean is that Angels are simply light beings that can help us on our path - just like our guides and passed over loved ones. Hundreds of years ago people saw these light beings and mistook their auras and light for wings. So actually, Angels don't even have wings! OMG craziness! It's totally OK if you imagine them with wings though, I mean wings are seriously cool, and an awesome symbol of power and freedom! Enough of the Angel history lecture, let's look at what's happening this week! OK, not the first time we've seen this card. You have the wand in your hand today, what are you going to use it for, good or evil? Of course you're going to use it for good. You have the power today, so be careful how you use it. Watch out for your thoughts and your words - catch yourself when you speak negatively about someone or something and try to change it around so you manifest good vibes instead of more negativity. This is the Four of Pentacles Angel card version and it's about the need for controlling finances, or even controlling others! Ouch. What are you trying to control right now that you need to let go of? It could be not delegating tasks to others, trying to control a situation or outcome that is totally out of your hands. You don't have to do everything on your own. In fact, you can't do everything on your own. Often we spend so much time working on forgiving others we forget to forgive ourselves. Maybe you have had really negative thoughts about others who've done something horrible to you. Forgive yourself for having these thoughts and make an intention to be kinder to yourself. We are human and we have egos and that means occasionally looking at someone on the street and thinking they look terrible. Notice that thought, notice the judgement, make an intention to try not to be so judgemental and then forgive yourself and move forward. You've been seriously pushing yourself this week, which is awesome, but this might be a good day to take a break. Take a hot bath with some Lush bubbles, send yourself to bed half an hour early, eat carbs and watch some mindless TV. Stop and breathe. This is the Queen of Swords from the traditional tarot. A brilliant woman, but is often seen as cold and not very in-tune with her emotions. Today might be a good day to warm up a little. Give someone a hug. Tell someone how you really feel, look at some cat videos on YouTube. Seek out some warm fuzzies today. Another day of rest! Yay! You are allowed to take the day off. I recently had a conversation with the wonderful Jo Westwood about taking time out. She helped me notice the difference between being 'on' and 'off'. When you are reading self-help books, working on your novel, typing up a blog post, practicing guitar, etc., you are 'on'. Even if you are doing something you love! Take time off today. That means time off from self-help books and creative projects too - this stuff takes a lot of your energy, even though it makes you feel great! Some days you just need to curl up with a novel or have a Greek marathon. Today you are allowed to do that, at least for half the day OK? Wow, we have so much air this week! This card today suggests someone around us might not have totally honest intentions. Listen to your gut today when you meet or speak with others. Stay in your bubble of golden light and don't give more than you can to others. This card flipped out at the end and I think this is kind of the over-all card for the week. We have The Dreamer (Archangel Metatron). This is the card numbered 0 and I think that's important. This week is the start of something new for all of us. A new leaf is being turned this week, a new way of thinking and being, and it's the beginning of a new amazing journey. I'm so glad that we are all on it together! But hey, guess what? We live in the world, and so money is a huge part of our lives, and the Four of Ariel reminds us this week to stop and think about how we are spending. Are you spending way too much? Or are you hoarding all your money away for a 'rainy day' and being kind of a Scrooge? And it works both ways. You might find yourself putting a bunch of stuff you don't really need or want back on the hangers, but you also might find yourself spending more money on things you wouldn't usually. I rarely spend a lot of money on crystals. I always pick up the £1 tumble stones, when really, because I love them so much, I should be looking at the £5 ones instead.